The Seventh Annual Gummibär Easter Basket Giveaway Begins - Gummybear International Inc.
Gummybear International is excited to share that the Seventh Annual Gummibär Easter Basket Giveaway has begun. The grand prize in the Easter Basket Day giveaway is an Easter basket filled with many Gummibär merch items and Easter goodies. This year, the Easter Basket Giveaway also includes a Jumbo 16″ Gummibär Plush Toy dressed in Easter-themed accessories, including a pair of bunny ears and Easter egg sunglasses. 2. 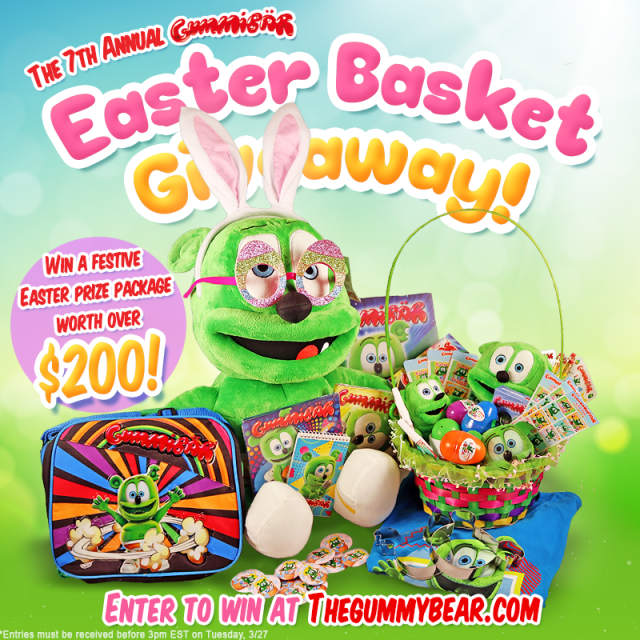 Fill out the entry form on the original Seventh Annual Gummibär Easter Basket Giveaway announcement post at thegummybear.com before 3:00 pm Eastern Time on Tuesday, March 27th. Giveaway is open until 3:00 pm EST on Tuesday, March 27th, 2018. One entry per person. One lucky random winner will be selected within 24 hours of the end of the giveaway and notified via email. The winner has 48 hours to respond to the email and claim their prize. Any prizes not claimed within that time frame are automatically forfeited and a new random winner will be selected. Prize will be mailed out within 2 business days of response.